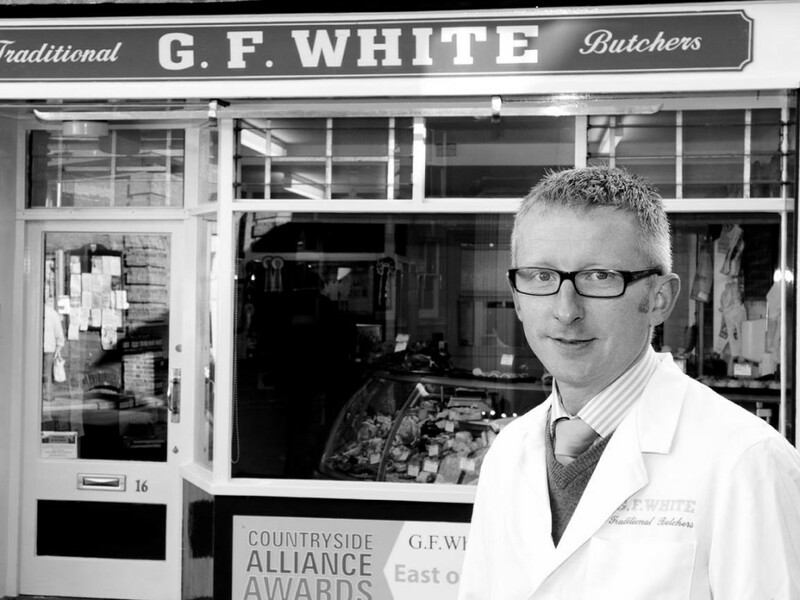 G. F. White Butchers are a Traditional Family Butchers, Purveyors of Fine Meats, based in Aylsham, Norfolk. We specialise in Meat, Game and Poultry. Meat has been our business for three family generations and we prepare many of our products to traditional family recipes. There are thousands of different cuts of meat and even more ways we can prepare it: cubed, diced, sliced, salted, smoked, minced, boned, rolled, stuffed… the list is endless. There are also many terms to describe the same thing. Don’t get confused by the choice. Give us a ring and tell us what you want to cook, how you want to cook it and what your budget is and we’ll recommend the best meat solution. If you would like to place an order give me, Crawford, a call. We are able by arrangement to slaughter and butcher your own stock.